My daughter is a huge fan of all things My Little Pony. What is there not to love? Friendship and positivity and they are so cute! My Little Pony: Friendship across Equestria was quickly loved in our home and all DVDs are treasured. 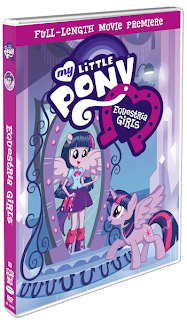 We repeatedly watch many My Little Pony and My Little Pony: Friendship across Equestria DVDs and this new DVD (available 03/01/16), MLP: Friendship Is Magic, will be equally loved I am sure! Make new friends with the most powerful magic in Equestria! The newest DVD release of the phenomenally popular My Little Pony – Friendship Is Magic contains 5 episodes and will arrive March 1, 2016 in the U.S. and Canada from Shout! Kids in collaboration with Hasbro Studios. Every Pony has learned the very valuable lesson that there simply is no power greater than the magic of friendship. Join Twilight Sparkle and her very best friends — Applejack, Rarity, Pinkie Pie, Rainbow Dash, Fluttershy and, of course, Spike — as they spread the word and the wonderful power of that friendship throughout their home of Ponyville and beyond, across the vast kingdom of Equestria! My Little Pony – Friendship Is Magic: Friends Across Equestria carries a suggested list price of $14.98 and is now available for pre-order at amazon.com, amazon.ca, and shoutkids.com. Enter to win your own copy of this DVD. Open to Canada & USA and ends on March 4th,2016. I was sent a copy of this DVD to help facilitate this post. All opinions are mine, as always. [Review] Muppets: Most Wanted – Muppets takes their stage show across the pond! I would like to win this book for my daughter, Natalie. She is 4 and she loves My Little Pony! My friend’s daughter would love this. My daughter loves My Little Pony. She would love this. would love to win for my little step daughter. I would love to win this for my two daughters. I would like to win the DVD for myself and my sister. My 6 year olds love my Little Pony. I can’t remember any of the names but I remember them from way back. Would love to win a copy of this DVD for my niece. I would like to win this for my great niece.